If you have keloid scars, chances are you’ve struggled with them for a while. 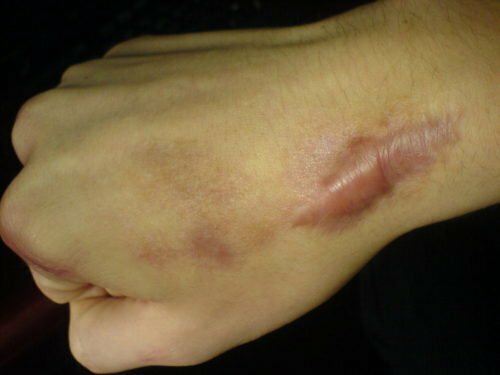 These scars are notorious for their ability to resist attempts to treat or remove them, and often regrow a few years later. You have most likely asked yourself how to remove keloid scars a number of times. Here are a few options you may have considered in the past. The aim of this keloid treatment method is to reduce inflammation via the reduction of the production of collagen and other proteins that form the fibrous scar tissue. The injections cause keloids to soften and become flatter, but there are a slew of undesirable side effects. First, the injections are painful. Afterwards, there’s a chance your skin pigmentation could become significantly lighter or darker, and develop red blotches. The worst possible side effect is tissue atrophy, or the complete or partial wasting away of tissues in the affected area of the body. The topical application of moisturizing oils works to keep the tissue soft. This may reduce some of the daily painful symptoms of having a keloid scar, but will not remove it entirely. This method of treatment is more effective for treating hypertrophic scars, not keloid scars. Hypertrophic scars are similar to keloids, but differ in their growth. Hypertrophic scars do not grow past the main area of the original injury, while keloid scars continue to grow without control. Cryotherapy involves freezing the scar tissue to kill cells that make up the keloid scar. Many patients deem this treatment too painful to continue after one session. Plus, it’s likely your skin will swell and blister afterwards. This option removes the entire scar at once, but unfortunately, most keloid scars will regrow a few years after the surgery. Superficial radiation therapy with the SRT-100ä has proven to be an effective keloid removal treatment option over 90% of the time. The machine delivers a precise, calibrated dose of radiation to the uppermost layers of skin, safely destroying the cells that form keloids. If you’re interested in learning more about the SRT-100ä to treat your keloid scars, contact Sensus Healthcare today. Should I Get the SRT-100 for My Practice?